Earlier in the book of Acts, Luke chronicled the story of Peter being held in prison by Herod. When an angel appeared to Peter and led in his miraculous escape Herod quickly executed all of the guards for letting Peter escape (Acts 12:19). Justice in the Roman Empire in those days was swift, severe, and not always just. If your job was to guard a prisoner and the prisoner escaped, the penalty was death. It was interesting to read a contrasting story in this morning’s chapter about Paul and Silas being thrown into prison in Philippi. 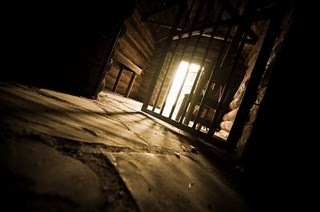 When a violent earthquake frees them to make a run for it, Paul and Silas choose to stay in prison. They were, in effect, saving the jailer’s life, and their unexpected act of grace leads to the jailer and his household choosing to become followers of Jesus. I find myself pondering the differences and the outcomes of these two stories this morning. Peter followed the angel to freedom and all of the guards were executed. When given an opportunity for escape, Paul and Silas chose to stay as an act of love and grace towards the jailer. Why didn’t Peter stay as a witness to his captors? The situations were different. Peter was instructed to leave by the angel and was under heavy guard. He was in Jerusalem and being persecuted by Herod who was a ruthless, violent, insane dictator. In contrast, Paul and Silas were in a relatively small backwater Greek town being held in jail with only one jailor being mentioned. The stakes were much lower and Paul held a trump card which he plays at the end of the chapter. He was a Roman citizen which came with it a host of privileges that were being denied him. Despite the momentary suffering of incarceration, Paul knew that he actually held an unknown advantage. Along life’s road I have observed that the institutional church and many Jesus followers desire faith and life to be simple and one-size-fits-all. As I wander through God’s Message I am reminded time and time again that following Jesus isn’t always that simple. God through Paul was merciful to the Philippian jailer, but all of Herod’s guards were summarily executed. Where was the mercy for them? Different time. Different place. Different circumstance. Different stakes. Different outcome. Today, I’m pondering the reality that God sometimes chooses to move in different ways in different times, places, and circumstances. My job is not to try and categorize, confine, and control what God will do, but be open to the fact that God, His intentions, and His actions are beyond my categorization, confine, and control. My job is, by faith and obedience, to continue following where I am led and let God work as He wills.